In fact, American consumer beliefs about protein content in common food items don’t align with reality. For example, 78% of respondents said they believed peanut butter is higher in protein than it actually is. Additionally, only 20% of respondents knew that shrimp is a high-protein food, and a majority of consumers didn’t recognize cottage cheese as a high-protein food, when in actuality, its protein count is quite high. Perhaps what is most interesting, is that the blockbuster protein sources—beef, chicken and pork—also didn’t score well in the minds of consumers, even though they’re all high-protein products. Notably, between 45% and 64% of consumers didn’t consider beef, chicken or pork to be high in protein…. Thanks to renewed interest in diets like paleo and keto, more Americans are looking to eat more protein, often with thoughts of slimming down or getting faster results in the gym. But there’s a science to how protein works with our bodies, and there are still other things to consider – like, for instance, you really don’t need THAT much protein. As we mentioned before, protein needs vary from person to person. One way to estimate is to multiply your weight (in pounds) by 0.36. The sum is the total grams of protein you likely need each day. For a 140-pound woman that equates to 53 grams of protein a day – an amount that could be easily achieved with a cup of mixed nuts and 3 ounces of meat each day. Yet as Nielsen also points out, the vast majority of purchasing decisions – 60% – are made in the store, right at the shelves, where all the marketing magic happens. Protein content is an instant eye-catcher now, even as labels also newly display their added sugar content. While meat, eggs, and dairy continue to be the most common sources of protein in the American diet, there are certainly plenty of good plant-based sources, as well. If you include any processed foods in your diet, options like the Beyond Burger from Beyond Meat feature a nutritional profile nearly equal to that of beef. Nuts, beans, leafy greens, and other vegan foods can likewise meet your protein needs – and do so deliciously, too! 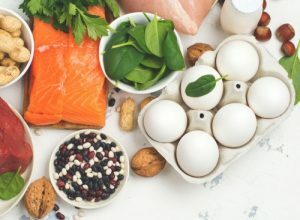 While benefits like quicker weight loss are often the most appealing reasons that folks are drawn to protein, it’s important to know that keto and similar diets have also been shown to support good systemic health in multiple ways. And, of course, more protein plus less sugar can be a big help for your oral health, as well. For one, protein provides the building blocks needed to repair, rebuild, and maintain your body’s tissues, including those in the mouth. Protein-rich foods may provide other benefits, as well. For instance, cheese contains compounds that help inhibit tooth decay, and peanuts can help stimulate saliva flow. Again, it doesn’t take much protein to reap its benefits – just enough, properly balanced within the whole diet. As ever, it’s the big picture that matters. We regret that we cannot comment or offer advice on specific dental health situations on this blog. Just give us a call at our office instead: (817) 461-9998. We’d be glad to speak with you.